Review: An 11 year old girl named Riley is uprooted from her Midwest life and moved to San Francisco when her father starts a new job. She goes through all the emotions: Joy, Fear, Anger, Disgust and Sadness. Most of the time she is trying to be positive while she is finding out how to navigate a new city, house and school. I felt that they dealt with the emotions in a very clever and sensitive way. A very funny and smart film. Reminded me a bit of the Toy Story films in many ways. You start to ask the question of can toys have feelings too? Each of the emotions are based on a shape. Joy is based on a star, Sadness is a teardrop, Anger is a fire brick, Fear is a raw nerve and Disgust is a broccoli. Each of the emotions also have a color. Yellow is Joy, green for Disgust, red for Anger, blue for Sadness and purple for Fear. The production designer Ralph Eggleston worked on this for five and a half years. 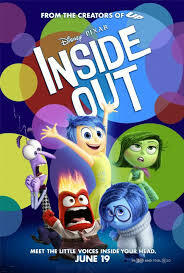 According to the BBFC Website it states that the overall message of this film emphasises that sadness is an important and essential emotion and that it is normal to feel sad sometimes. I wouldn’t be surprised at all if this film gets Oscar Nominations especially for Best Picture. At the Golden Globe Awards in 2016 this won Best Motion Picture – Animated. At the Bafta Awards in 2016 this won for Best Animated Film. At the Academy Awards also 2016 this won one Oscar and that was for Best Animated Feature. This movie is just so amazingly metaphorical! Awesome review! !